Hot rolled steel is generally used in parts where rust proofing is not critical. There are processes that allow hot rolled sheets to prevent rust as well. This process is called HRP&O - Hot rolled pickled and oiled. During the pickling process an acidic solution is used to remove contaminants and other unwanted elements such as stains and rust. Once this pickling process is complete the acid is rinsed off and dried. Once finished drying we then apply a thin film of oil to the steel to prevent it from rusting. Pickling and oiling improves hot-rolled durability and workablility at a low cost. It provides a cleaner surface hot rolled product suitable for painting with a limited barrier to rust formation. It is an all purpose steel product used for roll-formed shapes, pipe, tubing, industrial storage racks, automotive and other stampings, air compressor housings, filter housings, agricultural equipment, package strapping, and much more. Whatever product you are looking for, our team of dedicated, service and quality oriented steel experts are waiting to help fill your needs, just like we’ve been doing since 1976! 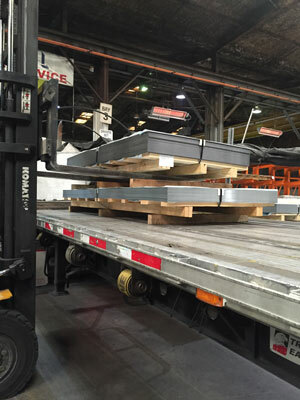 Curtis Steel has the experience and resources necessary to distribute industry-leading hot-rolled steel sheet & sheet metal products to meet your project requirements. Call us today at 1-800-749-4621 or contact us online and get a quote today!